M83 are a French electronic music band led by Anthony Gonzalez and currently based in Los Angeles. Formed in 2001 in Antibes, France, the band was initially a duo also featuring Nicolas Fromageau. The band has released seven albums and two soundtracks, including the Grammy Award-nominated Hurry Up, We're Dreaming. Gonzalez and Fromageau parted ways shortly after touring their second album Dead Cities, Red Seas & Lost Ghosts. Gonzalez records primarily on his own, with other artists as guest musicians. The band are signed to Mute Records and found international success in 2011 with the single "Midnight City". Their most recent album Junk was released in 2016. Anthony Gerard Gonzalez (born 1980) grew up in Antibes, France together with his brother Yann. His family had a great interest in football and Gonzalez had trials with AS Cannes, while his maternal grandfather is the French international Laurent Robuschi. At the age of 14 he got injured and turned to music instead after his parents bought him a guitar. Gonzalez developed his interest in music further and American culture while at secondary school. Together with Fromageau he formed a post-rock outfit called My Violent Wish. At the age of 17, Gonzalez bought a synth to record a demo, which he sent to a number of French labels. When the Paris-based Gooom Records appeared interested, he recruited Fromageau to "help me because I didn't feel like I had the shoulders to carry the project on my own". The band is named after the galaxy of the same name. In spring 2001, M83 released its self-titled debut album recorded on an 8-track while Gonzalez was still in college. The release did not attract much attention outside Europe until September 2005, when Mute Records reissued the album for a worldwide release. M83's second album Dead Cities, Red Seas & Lost Ghosts followed in spring 2003 (and summer 2004 in North America) to widespread critical acclaim. After worldwide touring for Dead Cities resumed, Nicolas Fromageau left the band and formed the band Team Ghost in 2009. Gonzalez returned to the studio to record the group's third studio album, Before the Dawn Heals Us, which was released in January 2005. 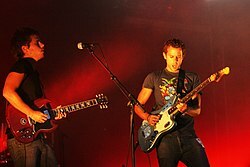 The same year, M83 provided a remix of "The Pioneers" by Bloc Party, which was also included on Bloc Party's remix album Silent Alarm Remixed. M83 also remixed Placebo's "Protège-Moi", Goldfrapp's "Black Cherry", Depeche Mode's "Suffer Well", Van She's "Kelly", and The Bumblebeez's "Vila Attack". Similarly, M83's songs have been remixed by Gooom labelmates Montag and Cyann & Ben. In 2006, after the Before the Dawn Heals Us US tour, Anthony Gonzalez continued to explore a musical direction already heard on earlier M83 tracks and began writing and recording a collection of ambient works. The album was recorded primarily at his home studio with the assistance of Antoine Gaillet. The resulting project was called Digital Shades Vol. 1, and was released in September 2007 with a sleeve illustrated by Laurent Fetis (known for his work with DJ Hell, Beck, and Tahiti 80). It is intended to be part of an ongoing series of ambient works. Saturdays = Youth, M83's fifth studio album, was released in April 2008. It was recorded with Ken Thomas (known for his work with Sigur Rós, The Sugarcubes, Boys in a Band, Cocteau Twins, and Suede), Ewan Pearson (who has also produced for Tracey Thorn, The Rapture and Ladytron) and Morgan Kibby (of The Romanovs). The album features a more focused approach to song structure and form, and Gonzalez stated that the main influence of the album came from music of the 1980s: "I think that '80s music is such a brilliant period for music history. It was the occasion for me to do a tribute to this '80s music, but [it was] also a tribute to my teenage years because the main theme of the album is being a teenager, and being a teenager means a lot to me." Four singles were released from the album: "Couleurs" in February 2008, "Graveyard Girl" in April, "Kim & Jessie" in July, and "We Own the Sky" in December. Redbull and Snowboarder Travis Rice used "We Own the Sky" as the opening song in the 2008 snowboard film That's It That's All. M83 also appeared on a limited edition split 7" single with Maps in 2008; M83 remixed Maps' "To the Sky", while Maps provided a remix of M83's "We Own the Sky". In December 2008, M83 supported Kings of Leon on its UK tour. In January and February 2009, M83 supported The Killers across United States tour dates and toured with Depeche Mode on its Tour of the Universe in Italy, Germany, and France. In July, M83 appeared at the Fuji Rock Festival in Japan. In July 2009, M83 appeared at the Wexner Center in Columbus, Ohio, when there was an altercation between Gonzalez and a security guard, the band later apologized to its fans for the incident. In 2010, on the eve of turning 30, Gonzalez moved to Los Angeles. In Spring 2010, M83 composed the score of French director Gilles Marchand's film Black Heaven. On 5 July 2010, the Black Heaven Soundtrack was released, which included two new songs by M83 called "Black Hole" and "Marion's Theme", along with five tracks from his back catalog. The soundtrack also includes songs from the score by Emmanuel D'Orlando, Moon Dailly and John & Jehn. However, his feelings towards the record were largely negative, leaving him depressed. In 2011, Gonzalez started working on a new batch of songs for an album slated for release later in the year. He described the tracks as darker and "very, very, very epic". Speaking with Spin, he said of the new album "It's a double album. It's mainly about dreams, how every one is different, how you dream differently when you're a kid, a teenager, or an adult. I'm really proud of it. If you're doing a very long album, all the songs need to be different and I think I've done that with this one." He recorded again with Morgan Kibby as well as others, including Medicine's mastermind Brad Laner, Nine Inch Nails bassist Justin Meldal-Johnsen and Zola Jesus. Hurry Up, We're Dreaming is Gonzalez's first double album, something he had dreamed of making ever since hearing The Smashing Pumpkins' Mellon Collie and the Infinite Sadness. "I wanted to make a very eclectic album but also something not too long. Making a double album was a dream of mine for a long, long time and I felt ready to make this move," he explains. Discussing the sound and process of creating this album, Gonzalez says it was "written like a soundtrack to an imaginary movie with different ambiances, different atmospheres, different tempos, different orchestrations and different instrumentation.... When I make an album it's always about nostalgia, melancholy in the past and memories." On 19 July 2011, the breakthrough single "Midnight City", the first from Hurry Up, We're Dreaming, was released for streaming and free download on the band's official website. Beginning in October, they toured North America and Europe to promote the album; Active Child supported the US leg of the tour. The album placed 3rd in Pitchfork's Top 50 Albums of 2011 list; the single "Midnight City" was placed 1st on the Top 100 Tracks list. On 26 January 2012, M83 came in at number 5 on the Triple J Hottest 100 with the single "Midnight City". The track received further exposure in 2013 as the remixed soundtrack to the Gucci Premier fragrance television advert featuring Blake Lively. On 28 June 2012, it was announced that M83 would compose the soundtrack for the 2013 movie Oblivion, directed by Joseph Kosinski and starring Tom Cruise. The score was co-written with Joseph Trapanese. The soundtrack album was released on 9 April 2013 by Back Lot Music. On 26 February 2014, a new song titled "I Need You" was included on the Divergent soundtrack. The song "Wait" was featured in the 2014 film The Fault in our Stars. It was also featured in the "Perception" episode of Revenge in 2012, "The Backup Dan" episode of Gossip Girl in 2012, "Imperfect Circles" episode of Under the Dome in 2013 and "The World Has Turned and Left Me Here" episode of The Vampire Diaries in 2014. Also from Hurry Up, We're Dreaming, two tracks, "Another Wave from You" and "Outro", featured in the 2014 remake of The Gambler. In 2015 and 2016, British-Franco-Canadian drama Versailles, uses "Outro" as the theme title. The Italian-French film Suburra from 2015 features music by M83 extensively. In August 2014, the first three albums produced by the band were re-released by Mute Records with additional material available separately for download. Gonzalez justified the reissues by noting that physical copies of the albums were hard to find and sold for "a ridiculous amount of money". On 2 March 2015, M83, with indie pop group Haim, released the song "Holes in the Sky" from The Divergent Series: Insurgent soundtrack. On 5 December 2016, it was announced that Gonzalez as M83 would be the composer and musical director for Cirque du Soleil's production of Volta in Montreal, Canada in April 2017. The band's musical aesthetic is characterized by extensive use of reverb effects and lyrics spoken softly over loud instruments. Gonzalez has been inspired by aspects of the American Dream and his songs have been outlined as themed around "adult-scripted teen dreams". Inspiration for the 1980s style found in much of Gonzalez’s music includes bands such as My Bloody Valentine, Pink Floyd, and Tangerine Dream. Between various electronic music properties and album artwork, M83’s style includes a mix of both contemporary pop and 1980s dream pop. ^ Hyden, Steven (17 October 2011). "Today in music videos: M83 gets creepy with telekinetic kids in "Midnight City"". The A.V. Club. Retrieved 7 August 2012. ^ Cubarrubia, RJ (10 April 2013). "M83, 'Oblivion' Director Explain Concept Behind Film's Music". Rolling Stone. Retrieved 4 September 2013. ^ "M83 Heralds Ambitious New Album with 'Midnight City'". Rolling Stone. 19 July 2011. Retrieved 4 September 2013. ^ "M83". The A.V. Club. 26 April 2012. Retrieved 4 September 2013. ^ Orzeck, Kurt (4 September 2007). "Every Time I Die Try To Slay Chiodos And Megadeth, In New Releases". MTV News. Retrieved 4 September 2013. ^ "M83 | Music Biography, Streaming Radio and Discography". AllMusic. Retrieved 2015-07-27. ^ a b Bainbridge, Luke (2011-09-10). "Anthony Gonzalez aka M83: 'I just turned 30 – it was time to try something I'd remember all my life."". the Guardian. Retrieved 2016-05-20. Eighteen months ago, having finished the acclaimed Saturdays = Youth tour, and approaching his 30th birthday, Gonzalez decided to make an abrupt change, and upped sticks for Los Angeles. ^ Klein, Joshua (November 18, 2011). "M83 reviewed at Lincoln Hall". Chicago Tribune. Retrieved 2016-05-20. ^ "Anthony Gerard Gonzalez director information. Free company director check.". www.cbetta.com. Retrieved 2016-05-20. ^ a b c Klock, Marie (15 April 2016). "3 questions à la maman d'Anthony Gonzalez (M83)". www.brain-magazine.fr. Retrieved 2016-05-20. ^ a b Delcourt, Maxime (May 10, 2016). "Je préfère regarder un Lorient-Rennes qu'un Manchester-Liverpool". sofoot.com (in French). Retrieved 2016-05-20. ^ a b c d e f g Cohen, Ian (26 August 2014). "Unrecorded Dreams: Anthony Gonzalez on M83's Early Years". pitchfork.com. Pitchfork. ^ "Dead Cities, Red Seas & Lost Ghosts reviews at". Metacritic.com. Retrieved 29 November 2011. ^ Roullier, Ian (12 February 2005). "M83 Before The Dawn Heals Us". SoundXP.com. ^ Raper, Dan. "M83: Digital Shades Volume 1 - Reviews". PopMatters. Retrieved 29 November 2011. ^ "M83 interview". Analogue Magazine. 23 October 2008. Retrieved 29 November 2011. ^ "That's It, That's All Soundtrack". Ridertunes.com. Retrieved 17 December 2012. ^ "Maps / M83—To The Sky / We Own The Sky at Discogs". Discogs.com. Retrieved 29 November 2011. ^ "M83 opening for Kings of Leon on U.K. tour - Prefix Magazine". Prefixmag.com. 8 October 2008. Retrieved 29 November 2011. ^ "M83 Killers Tour—antiMUSIC News". Antimusic.com. 26 November 2008. Retrieved 29 November 2011. ^ "M83—Tour of the Universe". Ilovem83.com. 3 November 2011. Retrieved 29 November 2011. ^ "M83 For Depeche Tour—25 March 2009". Clash Music. 25 March 2009. Retrieved 29 November 2011. ^  Archived 14 October 2009 at the Wayback Machine. ^ Davet, Stéphane (2012-03-09). "Adulé aux Etats-Unis, M83 s'attaque à la France". Le Monde.fr (in French). ISSN 1950-6244. Retrieved 2016-05-20. ^ a b Dombal, Ryan (22 November 2010). "M83 Talks "Very, Very, Very Epic" New Album | News". Pitchfork. Retrieved 29 November 2011. ^ "M83 Reveal Plans for "Epic" Double Album". Spin. 7 June 2011. Retrieved 19 July 2011. ^ Lindsay, Cam (2011-10-24). "M83's Double Standard". Exclaim.ca. Retrieved 2015-07-27. ^ Breihan, Tom (19 July 2011). "M83 Announces New Album; Hear New Track". Pitchfork. Retrieved 19 July 2011. ^ "Active Child to support M83 on USA". M83. 10 October 2011. Retrieved 20 February 2012. ^ "Staff Lists: The Top 50 Albums of 2011". Pitchfork. 15 December 2011. Retrieved 31 March 2012. ^ "Staff Lists: The Top 100 Tracks of 2011". Pitchfork. 2011-12-12. Retrieved 2013-09-28. ^ "Gucci Premiere: The Director's Cut featuring Blake lively Music Remix by M83 - Midnight City". YouTube. 5 March 2013. Retrieved 17 September 2014. ^ Jagernauth, Kevin (28 June 2012). "Exclusive: M83 Scoring Joseph Kosinski's Sci-Fi Film Oblivion Starring Tom Cruise". IndieWire. Retrieved 27 May 2014. ^ "Oblivion - Original Motion Picture Soundtrack: M83: Amazon.co.uk: MP3 Downloads". Amazon.co.uk. Retrieved 27 May 2014. ^ "M83 - I Need You". Indie Shuffle. 2014-01-27. ^ "M83 and HAIM join forces on "Holes in the Sky"". Consequence Of Sound. 2015-03-02. ^ "M83 reveals new album 'JUNK' for April 2016". Never Enough Notes. Never Enough Notes. Retrieved 1 March 2016. ^ "M83 New Album Junk Announced, Listen to New Single "Do It, Try It"". Pitchfork.com. Retrieved 20 May 2016. ^ "M83 announces initial tour dates for 2016". Consequenceofsound.net. 12 January 2016. Retrieved 29 December 2016. ^ "M83 Announces Cirque du Soleil Collaboration". pitchfork.com. 5 December 2016. Retrieved 30 December 2016. ^ a b c d "Discographie M83". lescharts.com (in French). Hung Medien. Retrieved 29 May 2012. ^ a b "Discography M83". australian-charts.com. Hung Medien. Retrieved 29 May 2012. ^ a b c "Discografie M83". ultratop.be (in Dutch). Hung Medien. Retrieved 29 May 2012. ^ a b "Discografie M83 Wallonie". ultratop.be (in French). Hung Medien. Retrieved 29 May 2016. ^ "Albums: Top 100". Nielsen SoundScan. CANOE. 27 October 2011. Archived from the original on 2 November 2011. Retrieved 29 May 2012. ^ a b "Discography M83". irish-charts.com. Hung Medien. Retrieved 29 May 2012. ^ "Discography M83". norwegiancharts.com. Hung Medien. Retrieved 29 May 2012. ^ a b "Discographie M83". hitparade.ch (in German). Hung Medien. Retrieved 29 May 2012. Before the Dawn Heals Us: Zywietz, Tobias. "Chart Log UK: M – My Vitriol". zobbel.de. Tobias Zywietz. Retrieved 5 December 2012. Hurry Up, We're Dreaming: "M83" (select "Albums" tab). Official Charts Company. Retrieved 29 May 2012. ^ "M83 Album & Song Chart History: Billboard 200". Billboard. Prometheus Global Media. Retrieved 29 May 2012. ^ "Upcoming Releases - HITS Daily Double". Hits Daily Double. Archived from the original on 2 April 2016. Retrieved 29 August 2016. All except noted: "M83". Official Charts Company. Retrieved 28 October 2016. "Run into Flowers": Zywietz, Tobias. "Chart Log UK: M – My Vitriol". Zobbel. Retrieved 5 December 2012. "Outro": Zywietz, Tobias. "Chart Log UK: 2013". Zobbel. Retrieved 5 October 2016. ^ "M83 Album & Song Chart History: Hot 100". Billboard. Prometheus Global Media. Retrieved 29 May 2012. ^ "M83 Album & Song Chart History: Alternative Songs". Billboard. Prometheus Global Media. Retrieved 29 May 2012. ^ "M83 Album & Song Chart History: Rock Songs". Billboard. Prometheus Global Media. Retrieved 29 May 2012. ^ "American certifications - M83". Recording Industry Association of America. Retrieved 5 December 2012.